2017 Leaf Valiant Baseball sees the return of the brand after a short hiatus with a redesigned appearance offering only signed cards. Every box promises five autographs in total and, similar to the 2017 football set, one of those signed cards is BGS-graded. Designed with a colorful background, the base Autograph set includes familiar talent such as Cody Bellinger along with top prospects like Gleyber Torres. Matching previous Leaf Valiant editions, there are plenty of parallels to chase, too. 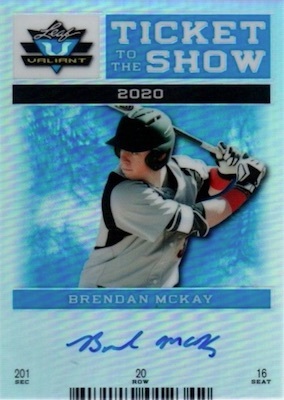 Collectors will find other signed options in 2017 Leaf Valiant Baseball showcase a background that corresponds to the set name. 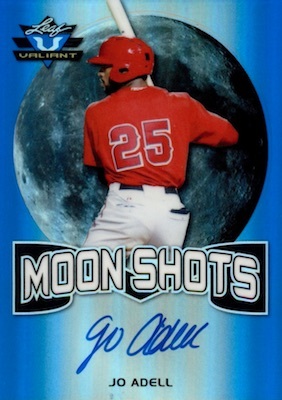 Moon Shots features a full moon behind the player, High Ceiling has several arrows pointing upwards, and Ticket to the Show resembles a game ticket. 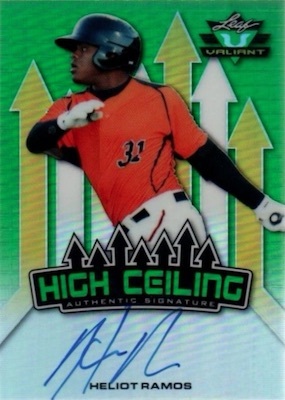 As with the base autographs, there are multiple colored parallels for each insert. Lastly, every box of 2017 Leaf Valiant Baseball guarantees one autographed card graded at BGS 9.5 or BGS 10. Adding to the excitement is the chance to pull a BGS 10 Black Label card. 2017 LEAF VALIANT 1st RC ADAM HASELEY BLUE PRISMATIC REFRACTOR AUTO 35 SHARP! 2017 LEAF VALIANT ADAM HASELEY TICKET TO THE SHOW REFRACTOR AUTO 15 SHARP! 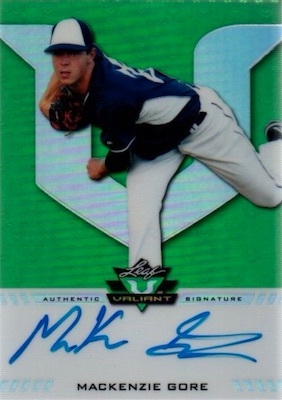 Shop 2017 Leaf Valiant Baseball autographs on eBay. 70 cards. Serial numbered #/99. Buy on eBay. PARALLEL CARDS: Blue #/35 (Bellinger - #/20*), Orange #/25 (Bellinger - #20*), Purple #/15, Yellow #/10, Black #/5, Red 1/1, Printing Plates 1/1 (No Cody Bellinger*). PARALLEL CARDS: Blue #/25, Orange #/25, Purple #/15, Yellow #/10, Black #/5, Red 1/1, Printing Plates 1/1. 5 cards. Serial numbered #/99. Nice cards. Got a Gavin Sheets gold auto /10 BGS 9.5. But why no sub grades, Beckett? The label looks naked without them. One box was more than enough.